The global blockbuster Black Panther reveals an unexpected and uncredited star – Birnin Zana – the film’s fictional capital city of African nation, Wakanda. Organic and dense, the city of Birnin Zana exhibits a preference for street life flowing through a medley of architecture constituting a wondrous and energetic cityscape – an imaginary example of a “traditional city” (a term coined by urbanist Andrew Alexander Price in reference to urban development that emerges organically over a span of time “by people colonizing and building close together”). The government of Wakanda does not wield technology, economics, architecture, or planning as a means of control. Nor does capitalism manifest as sterilizing culture. Instead, the capital of Black Panther is portrayed as a colorful and vibrant metropolis, one manifested in people with their own distinct music, language, fashion, dance, all surrounded by a dazzling polychromatic palette of patterns representing the numerous tribes unified under the singular banner of a country. Wakanda illustrates an ideal of technological supremacy, but not one antithetical to strong ties to ancient traditions and cultures. Black Panther’s artists and designers undoubtedly looked to real world architecture like the Reunification Monument in Yaounde, Cameroon (top) and the National Museum of African American History & Culture, Smithsonian Institution, Washington, (bottom) for real world inspiration for their imaginative depiction of Afro-futuristic urbanism. (CC BY-NC-SA 2.0 photos by Mark Fischer and Adam Fagen). Cities are living beings; they consume, respire, and excrete. What makes each city unique is how culture and history manifest in their planning, open space, and architecture. But in modern times, cities now reflect a sterile landscapes devoid of the identifiable unique characteristics traditional cities exhibit – a reflection of the influences of imperialism, capitalism, and globalism erasing regional and human-scale developments. This is not a fault of cities, but instead express the eventuality of a Western notion shaped by mechanized culture and easily replicable architecture. The city of Black Panther diverges away from this notion noticeably. Technology strengthens tradition: In typical depictions of the future, highly advanced technology coupled with trans-national economies results in a homogenized global culture, one where clothing, architecture, vehicles, and people adopt uniformity. Diversity in culture has given way to globalism and the ‘design’ of new technologies. Everything is sleek, colors are muted, and the city is building upon building, connected through flying cars, transport tubes, and transport pods. Machines, infrastructure, and technology are in the forefront of urban form, and life occurs inside. In Black Panther, Wakandan culture and tradition plays ever prominent. Coupled with the efficiency and power of technology is the expression of culture through color, pattern, and form. Urban form targets human-scaled interaction: One critique of the modern city is it focuses architecture over its inhabitants. Modern cities have lost touch with human scale, trading in human interaction for mechanical and technological transactions. Commerce was once local, and life was centered on the street. One of most memorable scenes of the film unfolds within the capital city of Birnin Zana, on its streets, where people are shown in relation to the surrounding urban form. Even in technologically advanced Wakanda, the street remains the place for social interaction, shopping, dining, and play. Culture expressed through architecture: Instead of a city of shiny glass towers, Wakanda’s architecture is shown spanning various ages with numerous traditional motifs applied across buildings. Old one-story buildings stand proudly next to 10-story buildings, with skyscrapers reminiscent of the real-life La Pyraminde in Abidjan or Kigali International Airport interspersed. This futuristic marriage between old and new architecture parallels the aforementioned merging of technology with tradition characterizing Wakanda as a nation and culture. Respect of Nature and Organicism: Wakanda portrays an imbued respect for the natural environment. The city is shown embedded within a beautiful natural environment, and throughout the film, the power and awe of the surrounding vast and pristine natural landscape is alluded to. Here, the landscape is not merely a backdrop, but the actual stage on which the capital city sits. The city is not a machine: Contemporary urbanism and planning tends to focus upon creating machines for living. Capitalism fed this notion as a form of public process and urban culture. Conversely, the traditionalist would say a city should serve the people, citing human interaction as the defining attribute of urbanism. Cultural nuance and variety physically expressed in urban architecture is important in establishing a city as purposefully human, and not a machine. Wakanda follows this standard. This is only a quick list of observations and thoughts after watching Black Panther. Someday I’d love to dive deeper and explore the influence of urban form in shaping the landscape of the city and their effects upon urban behavior. For now, Wakanda can serve as an imaginative ideal, one melding culture, nature, and architecture. In the opening scene of Damien Chazelle’s new movie musical, LA LA Land, the sound of honking begin before the visuals start (reality check: no one honks their horns in LA, for fear of being shot). The camera pans across a line of cars stuck in traffic on the 105/110 interchange. For a movie about Los Angeles, this is about as cliche as it gets…yet, also about as accurate as you can get considering we do have the worst traffic in country. As the camera pans across bored and miserable people baking in the sun and stuck in their cars, it suddenly climbs up above the traffic and zeros in on a specific women who starts to sing the opening number, “Another Day of Sun”. The woman jumps out of her car, convincing her fellow commuters to sing and dance their way across the freeway. As the camera deliriously pans back and forth over and around the freeway, the musical number reaches its climax, upon which everyone promptly gets back into their car and the honking resumes. The word “Winter” appears on the screen. The audience at the Vista Theater in Los Feliz chuckled in acknowledgment. Los Angeles is a city of great complexity and contradictions. As the movie moved onto follow two star-crossed lovers – a struggling jazz musician played by Ryan Gosling and a struggling actor portrayed by Emma Stone – I realize that director Damien Chazell, more than anyone I know, has a deep understanding of Los Angeles. As a contextual designer, I strive to understand a place, a site, a neighborhood, a city, a state, a country or wherever I need to design. Since the majority of my current work is in Los Angeles, I need to understand Los Angeles. But, LA is a city of contradictions. We are slow to accept change, but obsessively fast to implement change once it is accepted (see: public transportation). We revere aspects of the past, but are also quick to tear down reminders of that past (see: our penchant for destroying historical landmarks). We convey the Hollywood image to the world, but are really about our blue collar background (did you know that we are one of the largest manufacturing cities in the country?). LA LA Land uses the imagery and cliches of the City of Angels to say something more about the inner truth of this place. At one point Gosling’s character, a native Angeleno, criticizes Los Angeles: “We worship everything, but value nothing.” Even that statement is a cliche, but has truth to it. LA LA Land plays with these contradictions and layers them throughout its 128 minute playing time. It’s a modern musical shot in 1930’s style. It’s a fanciful drama of Old Hollywood Glamour set in Los Angeles gritty post-industrial neighborhoods – a “City of Stars” that regularly crushes its occupants aspirations and dreams, always precariously edging toward disaster, but maintaining stability somehow. What’s a designer to do? Like an author striving to write the “Great American Novel”, designers try to create the “Great American Place” – in my case, the “Great LA Place”. Maybe the key to designing in such a place is to embrace the complexity and contradictions of this city and try to ascertain the deeper meaning. Do we contradict ourselves because we honor and miss the past but recognize the need to move forward and change? Perhaps designing for our real life LA LA Land is really about designing to the vision of what Los Angeles wants to be. Perhaps we need to design for the ideal, the glamour, the image, but make those designs accessible to the reality of the people who live in this city. Exactly the correct Los Angeles question. It was 1982 when I visited the future. I had just caught the latest Harrison Ford flick, Blade Runner, with my high school buddies. Overall reviews for the movie amongst my friends were mixed, but the one thing we could agreed upon was that we had been transported to the 2019 version of Los Angeles. We were absolutely sure of it. For those who have not seen the movie [raised eyebrow], Ford plays an LAPD officer specializing in hunting down and killing artificial humans – “replicants” – who have broken their programming and illegally immigrated to Earth to blend in with humanity. The Los Angeles of Blade Runner is dirty and wet, an industrial and apocalyptic wreck of city rendered as dense as New York or Tokyo, but with the appearance of only a marginally functioning economy and environment. In fact, the smog in the movie is so dense, the city is drenched in perpetual rain. Teeming with criminals, the homeless, and policed by corrupt cops milling about around bombed-out buildings, the forecast looked grim. Yet, in 1982 this vision of LA seemed reasonable, if not guaranteed. New York City was in the midst of the worst year of crime on record, Los Angeles itself was an environmental wreck hidden beneath a perpetual thick brown haze. Thermonuclear war was a real concern as President Regan ramped up the military and rhetoric in an attempt to intimidate the Soviet Union to the bargaining table. By the mid-1980’s, a third of the American population believed nuclear war was inevitable, and a dystopian view of the future hung over our heads. Fast forward to 2016 and it seems dystopia has reemerged in popularity. Pop culture books/movies/shows like The Hunger Game , The Walking Dead, Divergent, and Maze Runner – all uber-popular fiction – revolve in a post-apocolyptic realm. Even the Star Trek franchise – originally built upon a utopian view of humanity’s future – has been rebooted with existential threats at the core of the franchise. Silver Lake’s Sunset Junction transformed into a zombie land in Fear The Walking Dead. Closer to home, Fear the Walking Dead shows a fully functioning Los Angeles descended into zombified hell. I have to admit a pleasure in seeing Sunset Junction in Silver Lake as a backdrop and in the opening scene of the pilot. So, why are we so hell-bent on a apocolyptic future? The world of 2016 is kind of scary place. Terrorist attacks, mass shootings, continuous war in the Middle East for over a decade, a highly polarized political state, horrible new diseases to worry about, 100 year storms with 1,000 year droughts, all with the looming concern of rising sea levels. With all this happening, no wonder many believe the end is nigh and the eventual outcome will resemble the fiction we so voraciously consume on television, movies, books, and video games. But we would also be wrong. I believe humans are way more resilient and a tad smarter than we give ourselves credit for. Those seeking a more optimistic vision of Los Angeles in the future should check out, Her. Starring Joaquin Phoenix and Scarlett Johansson, the film follows a sensitive guy going through a tough divorce who falls in love with his artificially intelligent computer operating system (just go with it). In Spike Jonze’s film, Los Angeles is doing pretty well. Angelenos live in a dense environment, but within sleek and clean hi-rises (that look suspiciously like Shanghai). Phoenix’s character walks and takes trains everywhere – a subway to Santa Monica and a high speed rail to the Sierra Nevadas. He visits parks and interesting public spaces where crime never seems to be a concern. Could this future be a possibility, or just as naive and fanciful as the Walking Dead’s vision of the City of Angels? AHBE Landscape Architects is in the middle of looking at a 100 year plan for the firm. At first, I thought this to be a silly exercise. But as we delve deeper and deeper into the plan, I realized that having a ridiculously long range view is an exercise in keeping faith in humanity. We are not planning on stockpiling guns and building bomb shelters. We are thinking about the real problems humanity faces and how our landscape architecture team might be able to solve those problems. We have to begin with the belief we’ll still be here in 100 years, perhaps still muddling through our problems, but surviving. I find that perspective comforting. If history has taught us anything, our fictional visions of the future are never correct. In the name of drama popular culture skews to extreme situations. Certainly the outcome of a 2 degree Celsius climate change event might seem cataclysmic, but in the end I believe humanity is resilient and will adapt to those changes. In other words, we may have to create a utopian society within a dystopian landscape. I was sitting home one weekend and my wife and I were watching an old movie, Star Trek Into Darkness on Netflix. There was one segment of the movie when I noticed something that looked very familiar. “That’s our project at California State University Northridge (CSUN). 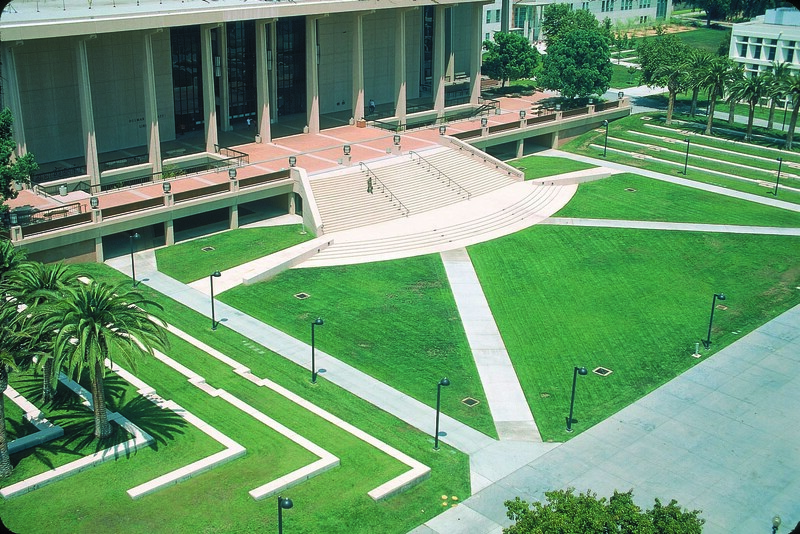 It’s the main campus quad in front of the Oviatt Library,” I remarked to my wife. Of course the amazing CGI work altered the context so it felt as if we were in San Francisco, set in the future. She laughed and said, “You always know where movies are taken”. I explained that after driving cross country several times when I was in college I got to know the various natural ecologies, geologies, and buildings in urban centers. So when I see a tree, a forest, a mountain, or even a building, I can recognize where the movie was shot. Another time while watching a lower budget movie, I noticed a Quercus Agrifolia (California Oak Tree) in a background scene, even though the movie was supposedly set in Wisconsin. What is even more entertaining was spotting a palm tree in a courtyard during a movie supposedly set in Canada, far from the adopted habitat of palm trees here in Los Angeles. All and all my wife and I get a good laugh sometimes noticing “Hollywood Ecology”.